Some nifty chord window generators, scale charts, etc, over at looknohands.com. ...and here's one for the Festive Season, the Gibson Christmas 2000 Acoustic Guitar! Makes you want to vomit, doesn't it? 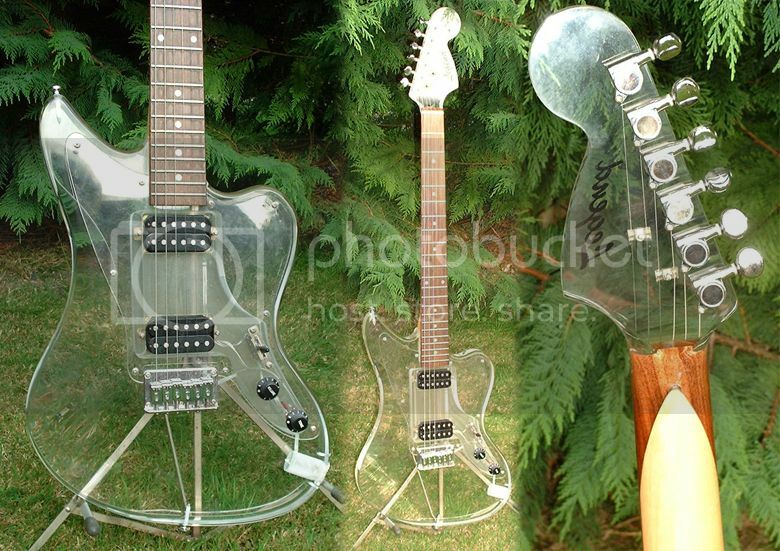 Peter Malinoski - more bizarre "art" guitars. Bullet Bars - custom steel guitar bars. The Tommyhawk acoustic travel guitar with neck, fingerboard, back, sides and bracing carved from one solid piece of mahogany! Smith Family Music featuring the now legendary Melobar - the slide guitar you can play whilst standing. I first saw one of these babies in the video for Captain Beefheart's "Ice Cream For Crow", and thought it looked well cool. Double Whammy! Because two tremolo arms are better than one! A guitar you can dismantle and stow away in an attache case - the Stow-Away from Stewart Guitars. Can I talk Didgeridoos for a moment? Yes, yes, I know this is a guitar website, but check out the unlikely sounding Didjbass which claims to be an electric didgeridoo and bass guitar all in one! Touch-style instruments from Warr Guitars (the Phalanx series must have the widest fingerboard I have ever seen). www.violinguitarmaker.com - this guy is nuts but you've just got to love his wild designs. This is a nice example of the ever-popular Italian-made Eko Ranger 12-string guitar. It is a full-sized acoustic guitar and is approximately 17 to 18 years old (I bought it new in the early 80s), and features the Eko company's trademark bolt-on neck (on an acoustic!). The guitar also features a Shadow piezo under-saddle pickup in the bridge, and an accompanying volume control on the upper shoulder near the neck. The pickup was installed at the factory and isn't a retro-fit. I have used it for recording the guitar (excellent sound) and also for playing through a PA system. The bad news is that the guitar does have one rather nasty knock to it, on the rear of the guitar at the base near the end-pin - see photo. I took it to a band rehearsal once (I don't know what I was thinking because we were a punk band) and the drummer was fooling around with it. Back at home afterwards I found the injury that had been inflicted on it. But that's drummers for you. However, the sound is not affected by this injury. I've played many 12-strings, including some a lot more expensive than this one, and I've never found another that I liked the sound of as much, nor that played as easily. The guitar has quite a low action to it, so this obviously increases playability. What else can I tell you about it? The neck is straight, the machine heads all work well, and the general condition is good apart from the one battlescar that I have already mentioned. My only reasons for selling are that my guitar "collection" needs to be cut down and I simply don't play this one any more. Brian May tells how he built that guitar. Tym Guitars - Australia's custom built Mosrite replicas. And now for something completely different: A story about repetitive strain injury from the BBC News Health and Safety pages (!) - Rock guitar is a pain. P Bass reaches 50 - The Fender Custom Shop is now taking orders for the 1951 Anniversary Precision Bass. Unveiled at summer's NAMM show, the bass will start shipping in October, the same month the in which the bass was originally launched 50 years ago. I have just noticed that you have left a complaint about the guitar project saying that the description was mis-leading, could you please contact me and advise why. I am happy to offer you a refund if you are not satisfied with the item you have received, it is not my intention to mislead anyone. "Guitar project Tanglewood strat copy for spares or repair good neck and hardware body badly damaged"
"Body badly damaged" - true. But the rest of the guitar is badly damaged too, which you hadn't implied. It certainly was not a case of "good neck and hardware". The neck is the most bent out of shape guitar neck I have ever seen. It is not repairable. So that leaves the hardware - pickups and pots are rusty looking underneath, as if the guitar had been kept somewhere damp. One machine head has the tuning button broken off, and the tremolo/bridge is incomplete. So basically it was £30 spent on some old pickups that have seen better days, plus pots and a few pieces of incomplete hardware. The guitar is not really repairable. It'll be interesting to see how he answers that. I don't see how he could possibly have thought that the neck was in good condition. He must know absolutely nothing about guitars, but even in that case he should have been able to spot the state it was in. I suppose the lesson to be learnt from this is to be very careful when buying old beat up guitars off eBay. Well, the Tanglewood Strat-style guitar turned up. And in short, it's a piece of crap. It looks as if someone has used it to smash up on stage. I don't know why they didn't finish the job properly having gone that far! The body is dented quite badly. It does appear to be solid wood, but the wood is not very hard. I will try removing the finish and sanding it down, and will attempt to fill in the dents and the holes using woodfiller as best I can. It's possible that it may not be salvagable though. The neck (which was listed as being "good") is the most bent out of shape guitar neck I have ever seen. I can't even get an allen key anywhere near the trussrod head to adjust it. Not that I think it'd help anyway. The fingerboard is also half hanging off. I've taken it entirely to bits and hopefully the pickups will be usable for another project. Those and the tremolo bridge (which is lacking saddles). I would say that I'd got a set of machine heads out of this too, but even one of those is lacking the tuning button. All in all, a disaster, but I will salvage what I can. Heart Strings: Fundraiser featuring opportunities to purchase custom, hand-painted Fender Stratocaster guitars by Eric Clapton, Shari Belafonte, Kevin Bacon, Elizabeth Hurley, Whoopi Goldberg and other celebrities. Despite the lack of punctuation, the implication is that the neck is straight (I do hope so!) and the hardware is all in good working order. As to what "Body damaged" means, I'm not so sure. Is it just damage to the finish as can be seen in the photo, or are there any serious cracks in the body. If it's the former, it'll be another strip and re-finish job, but if the body is seriously knackered then I'll need to cast it aside in favour of a replacement. Only one way to find out, and that is to wait and see, but here's hoping I got a bargain for 30 quid. All you ever wanted to know about the Basitar and Guitbass! Inspired by the Presidents Of The USA. 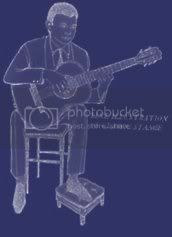 Tenorguitar.com is an excellent site devoted to this mysterious 4-stringed instrument. 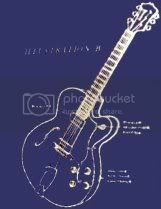 I've just spent quite a little while reading through Bob's guitar pages which he describes as "an information resource to both aspiring and existing hobbyist electric guitar makers". Really excellent stuff, and if you're after a custom made instrument, then his prices are very reasonable! Another modular guitar system - the Chrysalis Guitar system "consists of a family of interchangeable components which allow a musician to quickly assemble a full-size full-scale electric/acoustic guitar without tools. The parts snap together, and the strings are brought up to playing tension with a lever in the back of the headstock. With interchangable components, a wide variety of instrument forms can be created, including 6- and 12- string electric guitar, 6- and 12-string acoustic guitar, 8-string electric or acoustic mandocello and acoustic bass guitar configurations." "The guitar components are designed for rapid assembly and disassembly without tools, making it extremely compact for storage and transport. All of the parts for the guitar can be fit in a small cloth gig bag measuring 8" x 2" x 20" (10 cm x 5 cm x 40 cm)." Mike Rutherford's Custom Shergold Doubleneck - there were actually four "halves" of this instrument which could be clipped together in different double-neck combinations. Great website about these classic British guitars, by the way! Some very colourful and vivid graphics by Harley Guitars and a preponderance of parrots! Pictured: Elvis plays guitar (a Gibson Trini Lopez, I believe [edit: no it wasn't, it was a Hagstrom]): probably not the one his mother bought him for his 11th birthday. To re-cap, it's an Encore "Guitarist" guitar, very beaten-up and with missing pickup, knobs, bridge saddles, etc. The heavily-scratched body appeared to be made from MDF and still had the sheared-off pickup mounting screws stuck in the front of the body. The neck, however, is in very good condition, so I was considering marrying this neck to another - better quality - guitar body. Today I received a parcel containing the Telecaster body I've been expecting. The neck from the Encore would seem to be a perfect fit into the Telecaster's neck pocket, and indeed, I think that the shape of the headstock is aesthetically pleasing when used with this body shape. But I will have to make some careful measurements as it is highly likely that the body has been designed for a 21 fret neck whereas this is a 22 fret neck. This means the whole neck is slightly longer and to compensate for this the bridge on the guitar would have to sit slightly more forward from the usual position, bringing it very close to the rear pickup cavity. I'm wondering what are the rules governing distance from the rear pickup to the bridge. Obviously if it is too close, there will not be enough string vibration for the pickup to capture. But, of course, this depends on what kind of pickup I put into that rear cavity. If I put in a single coil pickup, I could position it away from the bridge. By the way, pickups I currently have available are a Seymour Duncan Stratocaster-style single coil pickup, and a DiMarzio humbucker, although I am still on the lookout for others (just in case). Another thing I have to bear in mind is the scratchplate and/or control plates that the body will need. I have no idea from where this body originated or who made it, but the routing is hardly typical telecaster. All the standard Telecaster-style scratch plates that I have seen (including Custom and Thinline variations) would not suit this body. For example, with a regular Telecaster scatch plate mounted on this body, the routing from the rear pickup to the control cavity would still be uncovered. Also, that control cavity looks longer than normal, so again, a standard Telecaster metal plate would not be suitable here. I need to find someone who can cut a custom plate to my own specifications. Continuing to re-attach the hardware, I put the pickup in place, followed by the scratchplate, thumb-rest, and the bridge. I then decided to put the strings on also, so I could see whether or not it was all going to work as it should. The strings were very old, flat wound (or tape wound), but that was unimportant; they still highlighted a very serious problem. The action was extremely high. Looking down the neck I could clearly see that, with the pull of the strings, the neck was as bent as a banana. The neck was still bowed! Replace the bridge with a Fender style one that sits lower down on the body, and which might help decrease the action and make the bowing less pronounced. Find a new (straight) neck. Either way, it's going to make this project much more expensive, and I can't see me being able to make my money back. But as it stands, no-one would buy a bass with a bowed neck. The Project: Short-scale bass guitar - Pt 5: We can rebuild it! UPDATE: Having applied five coats of the All In One finish to both the neck and the body and having built up quite a luxuriant rich-coloured finish, I decided to re-bolt the neck back in place, and have begun to add the hardware, e.g. the machine heads. I would add all the hardware, but am undecided if I want to put the old bridge back on, or whether to buy a new Fender-style bridge (in which case, would I need to fill in the holes for the old bridge?). It would also have been nice to have added a second pickup such as a jazz bass pickup in the treble position, but this would mean (a) buying the pickup (expensive) and (b) routing a cavity in the body to accommodate it. I think that for this project what I'm going to do is to leave it as a retro-piece, which just the single neck pickup. One very real problem that I have yet to address is the Big Hole in the front of the control cavity. Someone - a previous owner - had butchered this bass in an attempt to fit a Stratocaster-style recessed jack-plug socket. The only problem being that they couldn't actually fir this inside the control cavity, so they flipped it over so that it wasn't recessed by protruded outwards from the body! What a bodge job. Needless to say, I do not intend reinstalling this socket. A regular jack socket, mounted flush to the body should do nicely. Only, I have the Big Hole to contend with. So, I suppose I ought to mount the new socket on a plate of some kind. I might be able to buy something, or perhaps cut myself one from a piece of wood and stain it the same colour as the body. Cartoon time! Presenting Jackson's "The Simpsons" guitar and Gibson's "Beavis and Butthead" doubleneck. So, the doubts having settled firmly in my mind, I decided to go back to the drawing board, and stripped all the turquoise varnish off the neck. I then tried sanding down the finish I'd given the body, but it just wasn't happening, so I decided to re-apply the Nitro Mors varnish stripper and take it back to the bare wood again. Then, having sanded the neck until I was happy that it was nice and smooth and that there were no traces of turquoise left, I set to work applying the first layer of Ronseal All In One. I'd chosen a mahogany colour, which darkened the wood to a rich brown. It's so easy to apply, just wipe it in with a cloth. (Rubber gloves are adviseable though, because that stuff is so sticky!) After two hours I applied a second coat. Apparently two coats are all you need, but I think I'll go for at least four layers, because I'd like to build up a really nice finish on this. When I've sanded down the body again, and got rid of all evidence of the disasterous turquoise finish, then I'm going to use the Ronseal on the body too. And then it'll be re-build time! Alan Bond's Mandolin Museum and Ukecat Ukulele Museum - lots of photos of weird and wonderful instruments to gawp at. The electric eukulele! George Formby must be spinning in his grave. A four and a half - and a third - string bass guitar? Introducing the Step Neck Bass from READ Custom Instruments. The Bresh Dualette is a double-sided acoustic guitar - classical on one side and steel string on the other - built by Langejans Guitars for guitarist Thom Bresh. I've decided that I really don't like this turquoise finish, and in a mad moment tonight I took the whole lot off the neck using good ol' Nitro Mors once again. I'm still in two minds about whether or not to re-strip the body too. The problem is that this stain/varnish is nothing like I envisaged. I really wanted a translucent coloured stain, but this turquoise stuff is opaque and the consistency of paint. I may as well just have splashed emulsion all over it. The other problem is that is will not go smooth. There are little lumps and bubbles in it, and drips and brush marks everywhere. Sure, if I coat the whole thing in polyurathane afterwards, and sand that down after several layers I could achieve a nice glossy finish, but will the lumpy surface beneath be hidden beneath the layers of polyurathane or will it be magnified and be made to look worse? I've bought some sandpaper that is supposed to be good for sanding down between layers of applied paint on a project. I'll try this first and see if I can repair the awful sloppy varnishing. But if it looks bad, or starts taking chunks out back to the wood again, then I'm going to re-strip the whole thing. Again. And then - after more sanding - I would apply good old Ronseal All In One finish for an oiled natural wood look. Just apply it with a cloth. No fuss, no lumps; just nice and smooth. I'm certainly going to use All In One for the neck. This is turning out to be an expensive project, but I may as well get it right, and I should just look at these set-backs as part of a learning curve. Next time I'll know better! Guitars (and other instruments) made out of scrap metal. I particularly like the one made out of an old washing machine! Which of these is the World's largest - and supposedly playable - guitar? Could it be this Stratocaster from J T Hargreaves? Or how about this outsized heavy metal machine from J K Lado and Company? The Gibson website suggests that this Flying V is the largest, and it certainly looks it. But is it really playable? Update: Hendrix's flaming guitar fails to sell which isn't altogether unsurprising. More italian oddities over at the bizarrely-named Fetish Guitars website. Wandre guitars - very odd early aluminium necked beasties. Stig Petersen´s Basses - the fact that they only have 2 strings is one of the less eccentric features of these basses! Stripping the varnish from the neck was much the same procedure as it had been for the body, only this time I used masking tape to protect the fingerboard. Which turned out to be a waste of time in the eventuality, as the tape just came away when the stripping solution was applied. The varnish stripper I have been using is called Nitro Mors. It's the kind of thing that is used in furniture restoration, and it does its job very well, happily eating its way through lacquer and varnish. Having let the Nitro Mors do its stuff, I cleaned the neck off with white spirit and set to work on it with sandpaper, and soon obtained quite a satisfactory result. The only fly in the ointment was the total Pig's Ear of a job that someone had made of trying to add their own side dot markers to the top edge of the neck. Crude holes had been drilled straight into the wood of the neck - not even into the side of the fingerboard which would have been understandable - but into the neck itself. These holes had then been badly filled in with white woodfiller or something. A real bodge job. I took a drill to these dot markers and drilled out the white woodfiller, and then used woodfiller of my own (mahogany) which when sanded afterwards made the offending holes much less visible. The stain was a pain to find. Most shops I tried only seemed to stock wood stains and dyes in woody colours. I wanted a coloured colour. I was thinking blue, green, purple... something like that. Eventually I discovered that in Homebase you could get a base and have the lad in the shop add the colour of your choosing to it. Just what I wanted! So, I chose this turquoise colour. This particular woodstain is supposedly a varnish too, so I'm not sure - yet - what the effects of putting a polyurathane finish on over the top will be (as was my intention). Having applied the first coat of stain/varnish it struck me that my translucent stained wood effect is not really going to happen. I'll need to put a second coat on, and when that's in place the finish will be opaque. It wasn't quite what I was aiming for, but still has potential to look good. I've just received a parcel by courier containing this. It's an Encore budget model guitar, this version specially commissioned by Guitarist magazine back in the late 1980s (I think... else it may have been the early 90s). This is another "sold as seen" eBay purchase on my part, so whilst the guitar is incomplete, the £21 it cost me hardly broke the bank. Most obviously it is missing its pickup. That's easily solved. It is also missing two bridge saddles. Again, these are cheap and easy enough to replace. There are two ferrules missing on the machine heads, but a closer inspection reveals that the machine heads are cheap and nasty and most likely wouldn't do a very good job at keeping the guitar in tune, being the single strip open-backed type. Fortunately I'm expecting another eBay win to be arriving shorty - namely a set of machine heads taken off a Squier Strat. Or something like that. Otherwise the neck is fine, in general good condition with one or two minor knocks. The body is quite tatty and would need refinishing. I couldn't tell what the material was as that black is everywhere - in the pickup cavity, in the control cavity on the back, etc. So, I took the neck off and found an unpainted spot in the neck pocket. Looks like it's MDF or some very dense kind of chipboard! Ho hum! Well, at least that tells me that sanding it down and giving it a clear finish is an unwise move. So, I'm thinking of ideas for this one as a project. I was toying with the idea of making it into a travel guitar - putting a simple on-board amp and a little speaker into the body in the area between the pickup and neck, but there's only 4 inches to play with there so it might be tight. But I'm sure we can do something with this beastie. Another option might be to discard the body altogether, keeping the neck which is the best part of this guitar (it's actually a one-piece neck - that droopy head is not scarfed on - which is unusual coming from a budget instrument). I have a Telecaster style body arriving soon. Possibly I could marry this neck to that body. It's certainly worth trying out. The Frame Works guitar is a minimalist electro-acoustic that's truly portable. Is it a bass or is it a guitar? It's the Mobius Megatar. Sorry, but it looks like a rip-off of the Chapman Stick to me. Dodge Guitars offer the Dodge Convertible, a modular instrument featuring interchangeable middle sections of the body complete with various different pickup formats, whilst MEG - Modular Electric Guitar takes a different approach to the guitar with parts that you can chop and change. The Synsonics Terminator. Could this be the worst guitar ever? Some of these guys think so! Mind, there are several other contenders for the title over at Cheesy guitars. The Serial Number Guitar Dater for Fender guitars. An acoustic guitar made from a synthetic polymer rather than wood has been built in the UK by Loughborough University PhD designer Owain Pedgley and well-known luthier Rob Armstrong. Apparently the guitarist Gordon Giltrap is "really impressed with it and has recorded with it, so the instrument's reputation is growing all the while." Let's hope it's an improvement on this Yogi Bear plastic guitar. Vox Humana's 18-string bass - where will it all end? www.12stringbass.com - the URL says it all. Jackson car guitar - it actually rolls. (From the Jackson archives). This is one monster bass guitar from Conklin Guitars with twin 7 string necks! Ron's Crazy Guitars ... Hhhmmm... I reckon ol' Ron must be seriously disturbed, for these guitars are the stuff of nightmares. (Warning: japanese website). So, this weekend I visited my local hardware store and bought a bottle of paint and varnish remover, sandpaper, wire wool, white spirit, a brush, plastic sheeting and protective gloves. I had already removed all the hardware from the body of the bass, although getting the final screw out of the bridge was a challenge because the Philips style head slots had been totally worn away giving my screwdriver nothing to get a purchase on. I fixed that with the aid of my trusty mini drill. Setting up a wallpaper pasting table in the garden, I set out removing the finish from the body. The next couple of jobs are stripping down the neck - after all, I really ought to make it so that it matches the body, and applying a new finish. I'm still not sure what direction to take as regards the new finish. Seeing as I got rid of all the dark red varnish and that the wood is quite light underneath, this means that I can do virtually what I like with it. I quite fancy the idea of finishing the guitar in blue or green. But shall I stain it and then apply a clear coat over the top, or shall I use some kind of oiled finish such as Ronseal's All In One? This needs work to make it a playable guitar made around the late 60s in Japan, the model is Avon SG model 3405 ser no 0775, the back plate is missing needs the wiring sorting out, looks like a solid body,with a bolt on neck, so if you fancy sorting this out best of luck. "Hey, just a bit of wiring," I thought to myself, "I can do that. And it doesn't look too bad in the photos." Boy, was I in for a shock. When the bass finally arrived (the seller had detached the neck as he was worried it would get broken in the post!) I opened the box and my immediate impression was that I'd been sold a pile of junk. Quite frankly it was not worth my winning bid of £62 - not in the condition it was in. Which, in short, means that it was scratched and beaten up to buggery. Sure, I could wire it up (on a closer inspection it looks as if the problem may just have been that of the wire from the pickup touching terminals it shouldn't, and shorting them out) and get the damn thing working straight away, but it looks a sight, and if I want to re-sell it, I ain't going to get my money back, let alone make a profit. So, this was when I decided that I needed to re-finish the instrument. Strip it right down. And while I'm about it, I can change that vile hand-cut plate that the volume and tone knobs are mounted on... Oh, and that upside down Stratocaster style jack socket which is sticking OUT rather than in! What idiot was responsible for that? Design you own guitar: The KISEKAE Telecaster/Stratocaster virtual guitar modelling system. (Scroll down the page to the KISEKAE banner and click). Rod Clements from Lindisfarne is auctioning off some of his guitars on eBay, and I have been drooling over the pictures of this Ampeg-style Fretless Bass. Warning: Some of these links may expire soon. This is just plain silly... The Flamingo guitar which sports multiple necks for electric guitar, banjo, classical guitar and mandolin (as well as a flamingo neck!). Even more strings... These Harp Guitars are quite fascinating! ...and this Gretsch double-neck six-string bass/guitar is quite tasty too. Still on the topic of multi-stringed instruments, take a look at the Sympitar which is a standard six-string guitar with 12 resonating (sympathetic) strings running through the neck and down to a bridge set inside the body. Pah! Seven string guitars? That's nothing. Introducing the José Ramirez 10-String Guitar. And here's one from Woodfield Guitars which appears to have an extended fingerboard for the lower four strings. It looks way too complicated. And if you think that's complicated, take a look at these 14 string guitars belonging to Paul Garthwaite and Michael Bianco, and No - these do not have the strings arranged in pairs (courses) as on a traditional 12 string guitar. The prize for the most strings (albeit not all on one neck) must surely go to Pat Metheny's Pikasso guitar which sports two soundholes, three necks and forty-two strings in four groups. Unlike double-necked and other multi-necked instruments, this guitar is designed for compositions using all the strings played at once. Weird Vintage Guitars.com - a private collection for sale by the collector. Captain Sensible talks about his guitars and other equipment on his gear page over at the official website of The Damned. www.bunnybass.com - a fabulous bass guitar website. I especially like their Amusing basses galleries; I've seen quite a few contenders on eBay that they could add to the ever growing list. Refinishing your solid-body electric guitar by Edward Dijk. Which might be a useful link for an upcoming project of mine (i.e. making a decent bass guitar out of a well thrashed instrument bought "as seen" from eBay). "Who wants to be a guitar hero?" asks The Independent. South Africa's oil can guitars - how cool are these? When Alex Gregory originally came up with the design for a 7-string guitar he intended that it have a high A string, rather than a low B... The True History of the 7 String Electric Guitar. Hand carved guitars by Doug Rowell - the things this guy can do with a knife and a basic Fender Stratocaster! It's a Squier Stagemaster 7 ... basically a souped-up Strat with two humbuckers, 24 fret neck, hardtail bridge, and that all important extra low B-string. I love it! Now, here's a rather bizarre item... Jam Bass which according to the blurb "is a wafer-thin neck back panel for guitars that duplicates the bottom E and A strings fret by fret, voiced an octave lower like a bass guitar. The strip then plugs into a circuit pack that generates 128 Bass Audio Voices and also generates MIDI control signals!" Strawberry Alarm Clock's Mosrite guitars. Well wicked. A guitar famously burnt on stage by Jimi Hendrix is likely to become the most expensive guitar ever sold at auction when it is sold in September. Hendrix's Fender Stratocaster Sunburst, thought to be the same instrument that he set fire to at the London Astoria in 1967, is expected to fetch at least £400,000. He also burned it at the Miami Pop Festival the following year. Frank Zappa - who was also on the bill at the festival - found and restored the instrument and played it on his 1976 album Zoot Allures before forgetting about it. Zappa's son Dweezil found it in pieces under the stairs at his father's studio, and set about putting it back together. "It's a very inspiring guitar because it has such a unique history, one that can never be recreated," he told BBC News Online. "When I found it taken apart, in 1991, I told my dad I'd found the Hendrix guitar, and he said I should have it. Now I think it's time it should pass on to a new owner." Hendrix only owned two Sunbursts, and it is thought that this is the one that was torched on the two occasions, according to Ted Owen, of Cooper Owen auctioneers. "All of the Hendrix archivists and all of the books are pointing to the fact that it was originally burnt in 67 at the Astoria and was restored and burnt again in Miami," he told BBC News Online. "It's particularly burnt where the electrics were and the plastic scratch-plate area. The neck is completely burnt." Hendrix was recently voted the greatest guitarist of all time in a poll of readers of a UK music magazine. He once said: "The times I burnt my guitar it was like a sacrifice. You sacrifice the things you love. I love my guitar."